Helen Graves serves up a stunning porterhouse steak recipe, served with a rich beer and bone marrow sauce to complement this luxurious cut of beef. A temperature probe will come in handy for getting the steak cooked to just the right level. 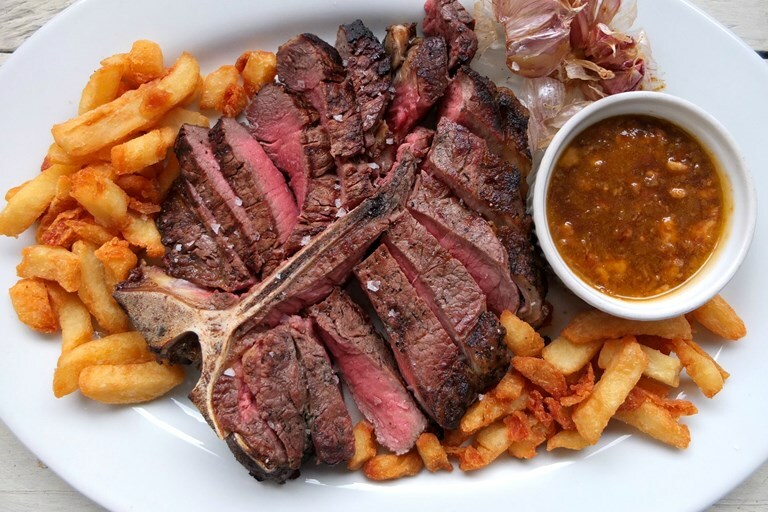 The porterhouse is essentially the same as a T-bone steak but often larger, consisting of a top sirloin cut on one side and tenderloin on the other. It’s perfect for sharing because, well, it’s massive, and the way it's cut means there’s plenty of super tender meat and then some with a little more bite – everyone is happy. 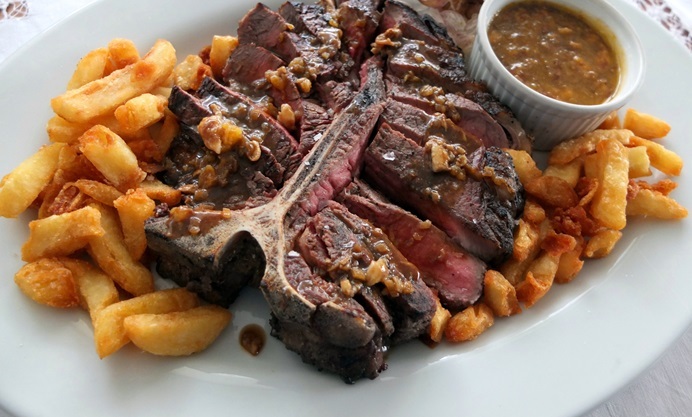 You can slice the cooked steak, place it on a sharing plate and let people choose their own cuts. The beer and bone marrow sauce is one of those recipes to keep in your arsenal and bring out when you need the big guns blazing. It’s deep, meaty and has a glorious rich mouth feel. I’d be very surprised if it didn’t win someone over. I wouldn’t worry too much about whether someone is a huge fan of gnarly bits like bone marrow. Personally, I’m not a huge fan of the stuff when served on it’s own (e.g. roasted) but in a sauce, it melts a little, bringing a silky intensity. The choice of beer is very important. You’ll need to use a soft and creamy beer like a milk stout – anything too bitter and hoppy will result in an unbalanced sauce. This is best served with triple-cooked chips and perhaps a sharp salad to contrast the other full-bodied flavours. Don’t forget to serve the remaining sauce on the side to dip your chips into and the leftover roasted garlic is great smeared onto bread or, well, pretty much anything.